29 Oct :The Indian Air Force’s Surya Kiran aerobatic team has reached China today, to perform at Zhuhai Air Show. An Air Show is held at Zhuhai (on the eastern coast, Near to Shanghai) in China every alternate year. 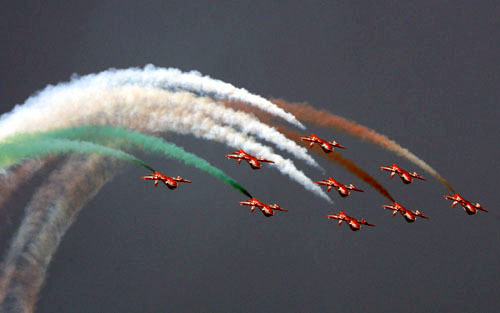 The show is akin to Aero India which is held at Yelahanka Air Base (Bangalore). IAF received an invite to participate in Seventh Chinese Aerospace Exhibition, Zhuhai (from 04 to 09 Nov 08) in early 2007. The Hon’ble RM Shri AK Antony approved the visit of Surya Kiran Aerobatic Team (SKAT). SKAT is proceeding to China to participate in the Aerospace Exhibition and on the return leg, SKAT would also carry out display in Vieng Chan which is the capital of Laos. Wg Cdr JT Kurien is the Commanding Officer of Suryakiran Team and the contingent would be headed by Gp Capt A Saxena. The 12 Kiran ac of the Surya Kiran Team would be supported by a contingent of 48 officers and 88 airmen. This includes two AN-32 and one IL-76 aircraft for transport support. SKAT departed from Bidar on 24 Oct 08 and would enter China on 29 Oct 08 and reach Zhuhai on 31 Oct 08. Similarly, on return leg, SKAT would ferry out from Zhuhaie on 12 Nov 08 and exit China on 14 Nov 08. During the route, the team would be transiting through the Chinese Airfields of Gasa, Kunming, Guiyang and Guilin. On the return, the air show at Vieng Chan (Laos) is planned on 17 Nov 08. IAF is the only air force which is carrying ot an air display in China. Thus, they are likely to be on the centre stage. Like the Exercise ‘Red Flag’ with USA which was a great success towards improvement in bilateral relations; it is envisaged that the SKAT would showcase the professionalism of IAF in China. Also, it would win goodwill of Chinese people and contribute to overall growth in the ties between the two countries.